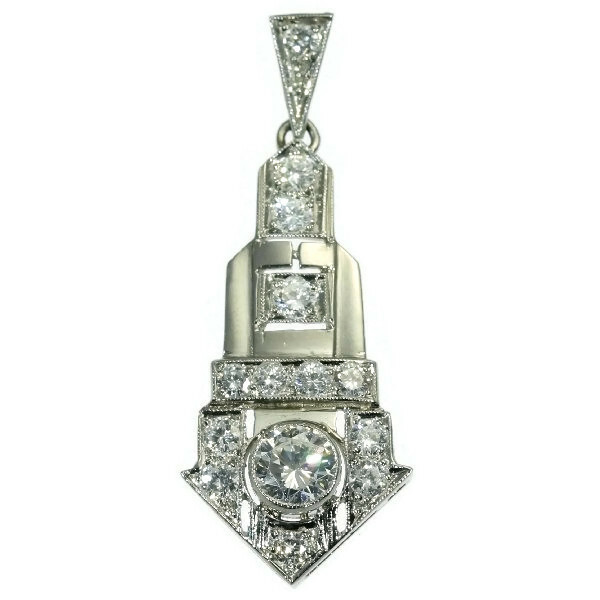 Typical high quality platinum diamond Art Deco pendant: Description by Adin Antique Jewelry. The grand old European cut diamond of this geometrically pierced platinum Art Deco pendant from 1920 beams its radiance from the arrowhead encrusted with five old European straight to your heart. Centring a smaller old European cut diamond, the arrow shaft is based on a lineage of four diamonds and is topped with another two diamonds. While dangling from a triangular diamond-set suspension, this stylish jewel will never miss its aim. Diamonds: One brilliant cut diamond with an estimated weight of approx. 0.50 crt. (approximate color and clarity: H, Si1) and 13 brilliant cut diamonds with a total estimated weight of approx. 0.80 crt. Total diamond weight: approx. 1.30 crt.